Italy's Venice is a city with many sights to see, but finding these sights can be difficult if you're not familiar with the town's address system. The city was built to make sense to those using the canals, not those on foot. You're bound to get lost at least once as you wander the streets searching for hidden gems of the city. A map may tell you the name of alleys and squares, but a typical Venetian address is simply: San Marco 1323. Venice is split into districts called sestieri, and each building in a sestiere is numbered in one long consecutive sequence. Venice's random and informal street names are not officially part of an address, although many businesses will helpfully provide one. To pin-point a location therefore, you don't just need the brief official address, you also need a street/square name and also some helpful geographical pointer, e.g. a nearby church. Even street names are far from straightforward. Most have evolved to describe an established location and mean descriptive things like 'Alley of the carpenters' or 'Courtyard with a well'. Consequently there are often several places with the same or similar names. If you are locating a street, you will require the name of the sestiere as well (what's more, sometimes there is more than one place with the same name in one sestiere). And even armed with official address, and street name, your task still isn't simple. The next confusion is that sometimes one place may have more than one name. Even one name may have different versions - many streets in Venice are known both by their dialect name and by the Italianised version. Either of these may appear on maps. This is why you'll see many variations of placenames such as Fondamenta Nove (even throughout this website). Streetsigns are not always easy to spot in narrow lanes. 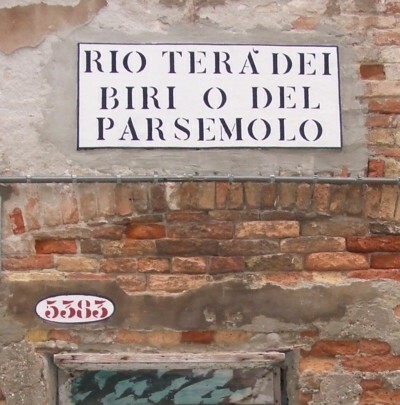 They may offer one or more variations on the name (o means 'or'), and they are often joined on the walls by signs identifying the parish (parocchia) and any adjacent canal (rio) or bridge (ponte). If you're spending a long time in Venice or are just very interested in the city's structure, there is a good book called Calli, Campielli e Canali which provides extremely large scale street plans, along with property numbers. It covers Venice and the lagoon islands, and enables you to locate any address in the city, as well as providing some background information in Italian and English on landmarks and principal buildings. You can buy it in most bookshops in Venice. Sadly, it's rather too bulky to carry around as you explore. Here are some of the most common titles for places in Venice: Calle - a lane or alley Campo - public open space (irregularly-shaped and less formal than a 'piazza'). Campo means field, and once these were rough-surfaced in earth or grass, and used for burials. They are still the hubs of their neighbourhoods. Campiello - a small square or courtyard. Corte - courtyard. Fondamenta - canalside walkway. Piazza - public square. There is only one in Venice, Piazza San Marco. Ponte - bridge. Piscina - filled-in pool of water. Ruga - significant lane, generally one which used to contain shops. Ramo - branch off a more important thoroughfare, whose name it takes. Rio - canal. Rio terrà or terà - filled-in canal, now a street. Salizzada - name given to the earliest streets to be paved. Sottoportego - covered passage under a building, often leading only to water. You can spend many idle moments in Venice evolving navigational theories. Landmarks are all-important, both major ones and private reminders. Routes between significant points are learned this way: e.g. ' left by the greengrocers, straight over the square with a tree in it, down the lane between the red house and the yellow house, left past the Renaissance doorway'. Even if you're the sort of person who has an excellent sense of direction, you'll still find that concentrating on a chain of landmarks is more effective in Venice than working from a mental map. If you're arriving for the first time and finding your hotel, make sure they give you simple, descriptive directions. Once you've found your base, memorise the route to the nearest major landmark or street (one that's marked on your map) - then you'll be able to find your way back. While route-finding and consulting maps, do bear in mind the Venetian rules of conduct; walk on the right and don't block streets. There are certain through-routes in Venice - chains of lanes linking places together. At busy times of the day you'll see locals filing along these tortuous routes, striding down seeming dead-end alleys and darting around sharp corners. After a while you learn those of use to you, and create your own mental database of Venetian routes. The only destinations signposted at all consistently are St. Mark's (San Marco), the Rialto, the railway station (Ferrovia) and the bus terminus (Piazzale Roma). Even these painted signs do sometimes falter, but generally they are reliable and can help you to head in the right direction. The ones to San Marco are the most suspect, as some signposted lanes can take you a long way round (something to do with shopkeepers wanting passing trade, perhaps? ).